This odd plant has long adiaxal areoles that stretch out to a greater or the full length of the tubercle and uncommon short pectinated spines . Origin and Habitat: Mexico, San Louis potosi, To Huizache (?) 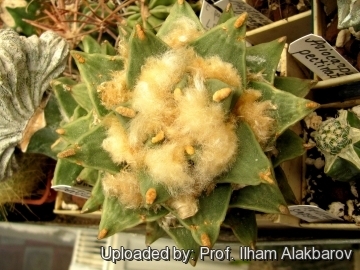 but plant described from cultivated specimen. 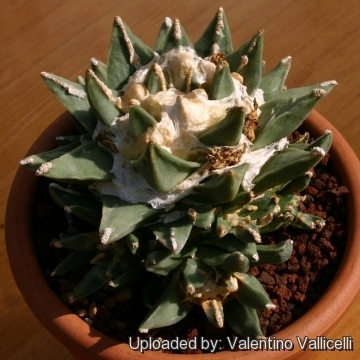 Description: This plant differs from the standard Ariocarpus retusus, for its short pectinated spines already present in young specimens. 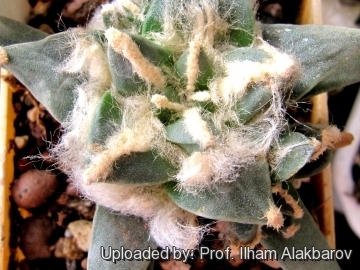 The spines persist with the age, but in adult plant they are partially covered by fur. 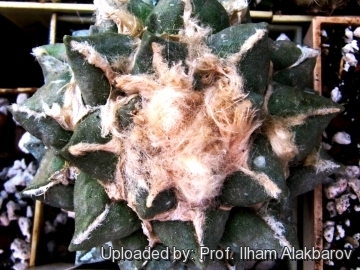 Similar species: Ariocarpus fissuratus f. pectinatus shows similar pectinated spines, and is much more common in cultivation. Stem: Dull green, flattened, globose, rounded on top, 3-12cm high, 10-15cm in diameter. Spines: 1,2 to 2,0 mm long, dull. Areoles: At the tips and extending on the upper side of the tubercles, elongated from 2,5 to 20,0 mm long, wooly. 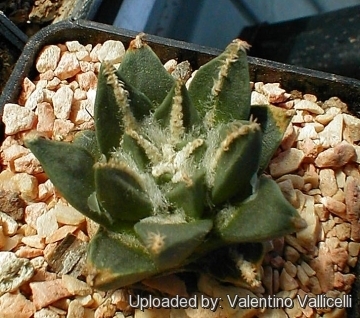 Remarks: Ariocarpus retusus is an extremely variable species,. Tubercle size and shape vary widely, a terminal areole is sometimes present at the tip. The vast amount of phenotypic variation in the species has led to the erection of several variants. 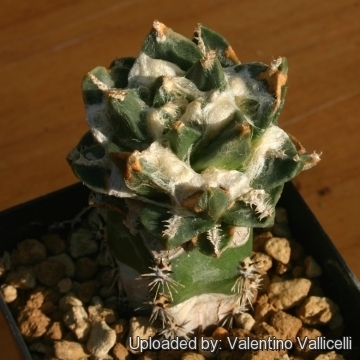 Cultivation and Propagation: This species is slow growing but certainly not as slow as some other types of cacti, it is of easy culture in a well drained non-organic free draining soil compost, with ample water during the growing season. Use of a weak low-nitrogen fertilizer during the growing season can encourage growth. The main threat to their development is root rot. 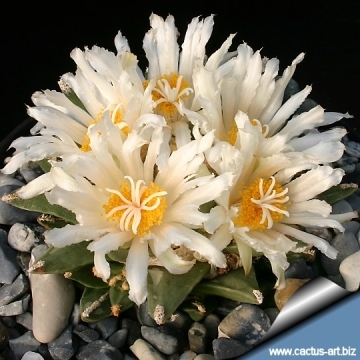 Ariocarpus should be kept dry whenever there is a threat of cold. 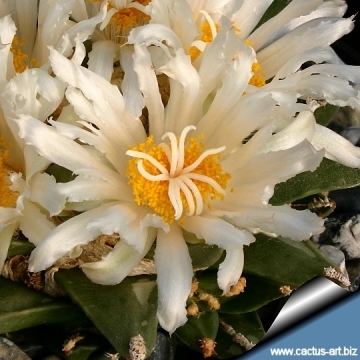 The appearance of Ariocarpus can benefit greatly by watering the plants from the bottom. This practice will help to keep the “wool” on the top of the plant from becoming matted or discoloured. Need light shade to full sun. 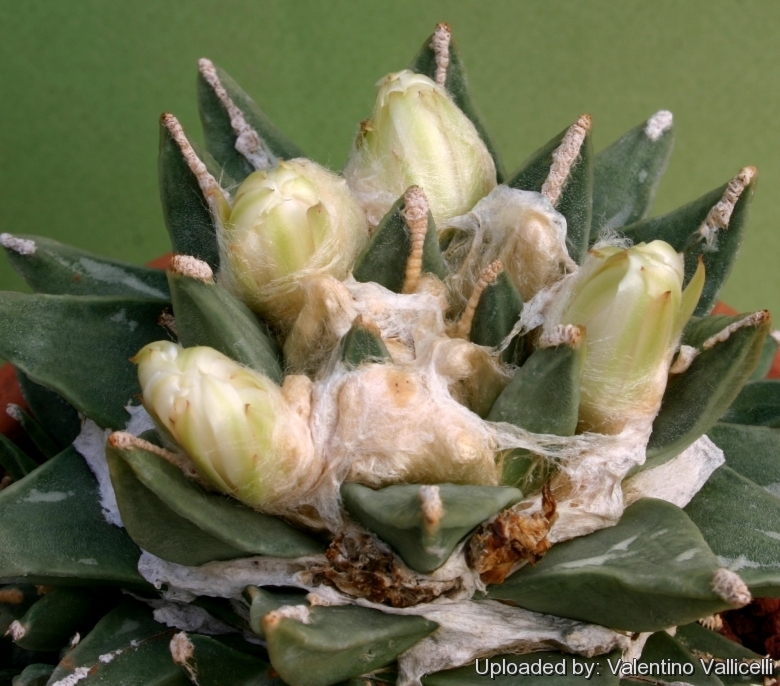 Frost Tolerance: Hardy to -10° C.
Propagation: Ariocarpus retusus is probably the easiest species of the genus to raise from seed, but will generally take about 6-10 years to reach flowering size, this rare form is frequently grafted to speed the growth rate.